Ideal for stuffing for retail applications. Cleaner, Neater & easier to use than conventional stuffing paper. 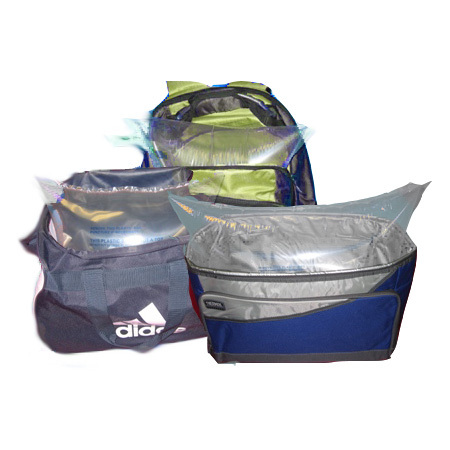 Choose from 6 stock sizes to fit all your bag sizes. Simply choose the correct size, place it into the soft side luggage or any backpack or duffel bag. Close the zipper 3/4 of the way and insert the dispenser nozzle into the valve, inflate to the desired amount then remove the nozzle. The self sealing valve will seal itself. Close the zipper and display. Made of a strong air retentive plastic, the Air-Bladder is perfect for replacing messy stuffing paper and is a replacement to a messy sales floor. Looking for a Split Case? Click here to Order (100 piece minimum).